So you’re thinking about getting some goldfish. The good news is there are tons of goldfish-specific tanks on the market or ones that work for small or tropical fish! We’ve put together this fish tank for goldfish buying guide to help you choose the right one for you! Your fish will love any one of these new homes! Before we get started, here are some things that you should look for before you start shopping. Capacity: This is how many gallons the tank can hold. Certain types of fish need more room than others. If you’re buying multiple goldfish, you’re going to need a tank big enough for them. This is important information. Material: Fish tanks are made of acrylic or glass. Which material is best for your aquarium depends on what’s living in yours. Acrylic is lighter weight and usually less expensive, but it scratches easily. Glass is heavier, can shatter leaving you with a mess, and can usually only be made into rectangular shapes. Look at this information to help you decide which is best for you. LED Light: Some tanks have LED lights built into the hood so you can see your fish at night and give them daylight-type lighting even when they aren’t near a window or other light source. You’ll both be happier! Pieces: This is how many pieces come with the tank. Most come with a filter and cartridge as well as a hood and other accessories to make the perfect happy home for your fish! More accessories is a better buy! Filter: Filters are especially important for goldfish. They’ll keep the water in your tank oxygenated so the fish can breathe a little easier, as well as maintaining the water and keeping it cleaner. Look for an integrated filter! Size: This is how big the tank is, or its dimensions. If you have a limited amount of space, this is important so you can tell if the tank is going to fit. Otherwise, it’s good for planning out your space! Now we can get to our fish tank reviews! We've researched and reviewed a selection of tanks to bring you the best that is specifically made for goldfish! If you're in a hurry, check out our top pick and budget pick before you swim off! They will show you what's available on both ends of the spectrum. The rest of the tanks on our list are pretty awesome, so stick around to the end! Find a tank that you'll love! 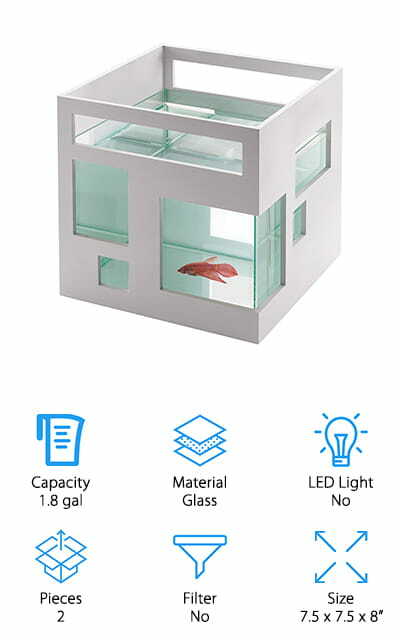 The Tetra Cube Aquarium is a cozy and beautiful home for your fish! It's made of plastic that's just as clear as glass, so it's shatterproof. Ease your mind while you're cleaning it! The hood is made of the same super clear plastic and features a hole that makes it easier to feed your fish. 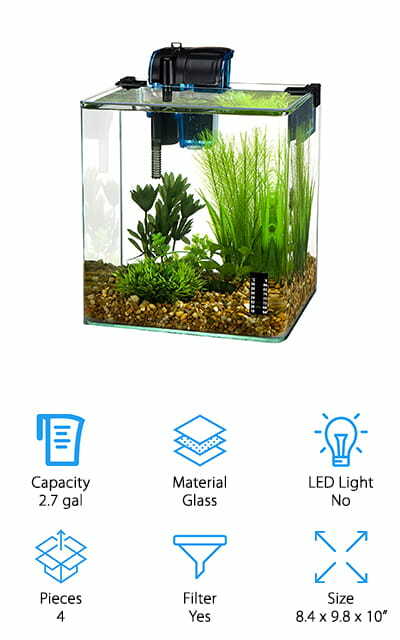 It's small enough to fit almost anywhere in your home, and features a Tetra 3i filter to keep your fish healthy and swimming happily! 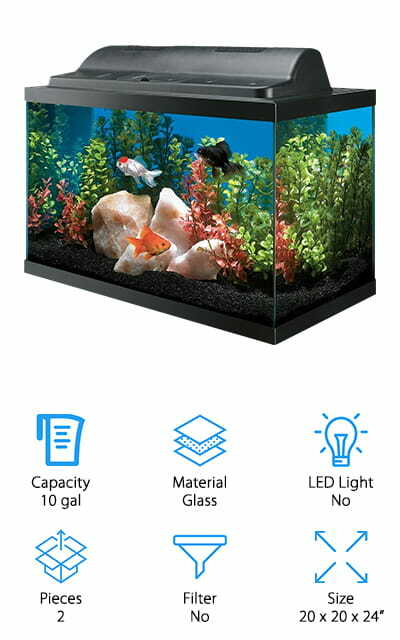 There's even an LED light nestled into the top so that you can see your fish more clearly through the panoramic, single piece of glass with no seams. It's easily the best tank for goldfish that we found – and it works for small tropical fish and the popular betta fish as well. It is shaped like a perfect cube with the same measurements on all sides, to fit perfectly in any space that you want it to! The API Aquaview is a circular tank kit that can be plugged in via power adapter or USB connector if you purchase the optional attachments online. It comes with a filter that uses Tetra XS filter cartridges. Our pick for the best cheap fish tank is really small as far as fish tanks go, as it only has a two-gallon capacity. It's the perfect home for one or two fish! What we found really amazing about this tank is the lighting system. There are seven different color options for the LED light, including purple, green, red, daylight white, amber, blue, and aqua. You can use the included remote to change the lighting settings. It's energy efficient! There are 4 transitioning colors and color combinations available! Even better, there's a timer selection for the light. You can leave it on continuously, or run in 2- and 4-hour intervals. How cool is that? We loved the color options! The 5-gallon Marineland Portrait Aquarium is made of curved glass, so you can get the best views of your fish! There's a hidden filtration system in the back that filters in three-stages, and it includes the cartridge, bio-foam, and pump to make it work. There is an LED light integrated into the hood that can be either white or blue when it's turned on. Both create a sunlight effect under the water, a shimmering light that shifts with the waves. This aquarium comes with a glass canopy that slides back when you need to get to the water for feeding or cleaning. It's easy to put together and keep functional and comes with a base as well for an attractive design. We love the curved glass design and the LED lighting system – it's your fishes' own underwater paradise. Add some colorful rocks, plants, and décor, and you'll have the perfect ecosystem for your underwater companion to thrive! The Fluval Spec 5-gallon tank is the perfect blend of function and design. The aquarium is made of etched glass, so you will be able to get the best look at your fish all the time. 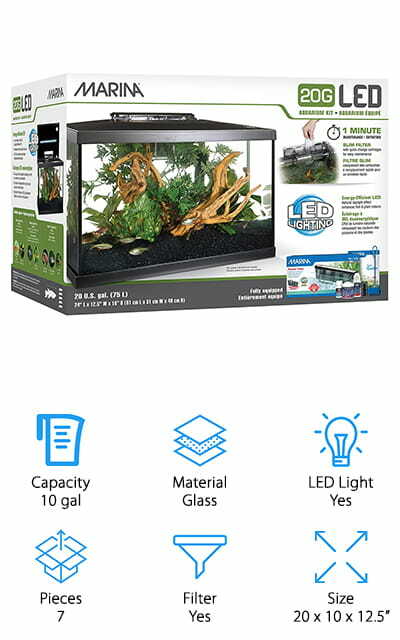 This is made especially easy by the lighting system, a panel of 37 LEDs that hangs over the aquarium, providing you with consistent, bright-as-daylight lighting for the perfect view of your underwater pets. It comes with a pump, adjustable nozzle, and a 3-stage filtration system to keep your water clear and cleaner than anything! You won't have to buy any extra parts, because it comes with everything needed for the filter, including bio rings! And when you need to service the pump and filter, they are contained in their own chamber so you don't have to disturb your fish to do any quick repairs. The trim on this tank is aluminum, making it look stylish while still being as functional as ever! We absolutely love the Umbra FishHotel's design! It's definitely modern and beautiful and consists of a 1.8-gallon glass tank encased in a plastic façade. This outer shell is a cube and features asymmetrical windows, making it look like a tiny aquatic condo. You can remove the inner tank to clean it, which is a really useful feature, and the outer portion can be painted or decorated to match whatever else you have going on in your space. Your goldfish is going to love this small, cozy home – fill it with the perfect décor and they will be quite the happy little fish! 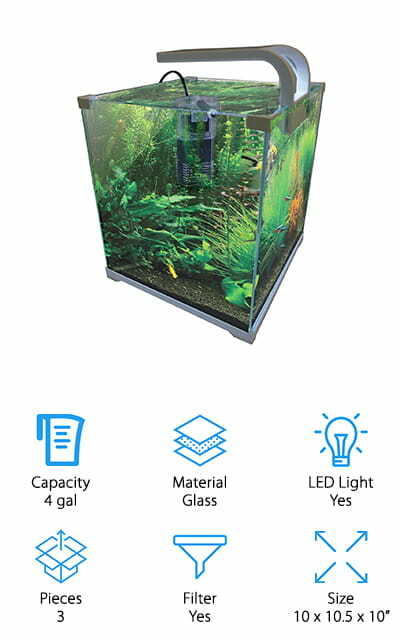 What makes this a contender for the best fish tank for sale is the way that you can stack the units to make a multi-level aquarium. Each of your fish can have their own living space! This is especially perfect for betta fish because they can't live in the same aquarium. But keeping them in these aquariums will make a beautiful display! The 10-gallon Marina LED kit has got to be one of the best fish tanks for goldfish because of all the extras it comes with! The size and capacity mean that you can keep a larger number of goldfish together. Just remember that goldfish grow to fit their surroundings, so you could put up to four goldfish in this tank that will remain a manageable size. This aquarium is made completely of glass, with an LED lighting kid in the canopy that will allow you to see all of your fish in full color, no matter what day it is! What we thought was awesome about this kit is that comes with fish food, water conditioner, supplement chemicals for balancing the water, as well as a net and a care guide that tells you all you need to know about setting up your tank. It comes with everything but the fish! Get your tank started the right way! The Penn Plax Vertex is a great goldfish tank for a beginner or someone who doesn't have any accessories for their fish yet. The tank houses 2.7 gallons of water and is made entirely of bent glass, which allows you a better view of your fish from every angle. It's also frameless! We love the views of your fish! The water filter hangs on the side of the tank for convenience, and you can adjust the flow setting for how much water it filters at once. The lid or canopy for this aquarium is hinged so you can easily get into the aquarium. This amazing kit also comes with a water thermometer so you can always keep your tank at the optimal temperature for your fish. It's small enough to fit in smaller spaces while still giving your fish plenty of room. Some tank decorations and separate LED lighting could easily make this the best fish tank for goldfish! 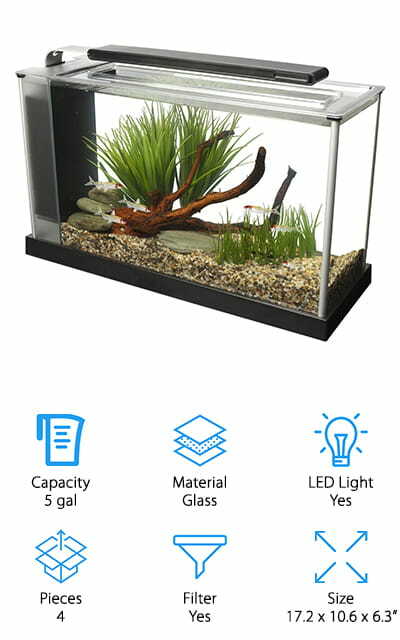 The Aqueon Starter Kit is a goldfish tank that comes with just about everything but the goldfish! This nifty set includes cool white LED lamps so the entire tank lights up, a feeding door on the front of the tank (we love this feature!) as well as sections in the back that break apart so you can add accessories. 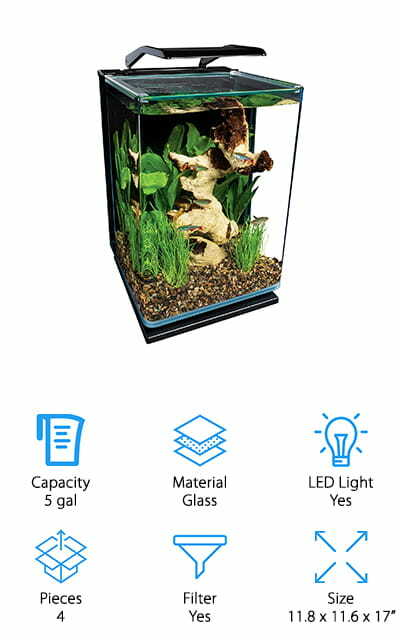 It comes with a water conditioner for keeping the water healthy for your fish, a heater for tropical breeds, a power filter to keep the water clean and clear, as well as fish food and a fishnet. It even comes with a water thermometer to make sure that your tank is always the optimal temperature. The filter is super quiet, so you can keep this tank anywhere. When it's time to change the filter cartridge, the LED lights on the canopy will start to flash to alert you – and we think that's pretty much the coolest feature we've seen! This 10-gallon aquarium is completely made of high-quality glass. The seals are solid, so you won't get any leaks, and there are even breakaway parts on the back of the tank where you can fit the filter or pump when you get them. 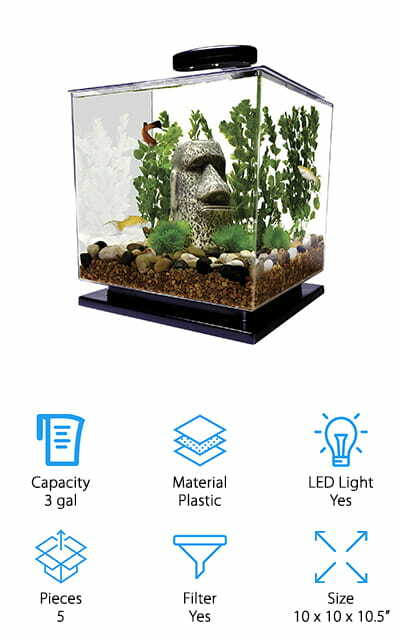 It is a small aquarium with an eco-hood that houses two fluorescent bulbs, which are sold separately. It has a unique lighting system! The aquarium is trimmed in black and easy to set up and maintain. 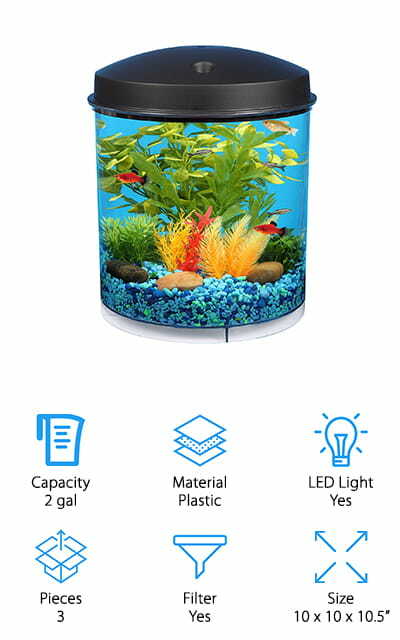 This is the best goldfish tank for kids or beginners who aren't sure if they're going to like keeping fish, as it's fairly cheap, large enough for multiple fish, and you can customize the accessories based on what you want. Some rocks, plants, and décor will keep this fish tank beautiful for years! We love how simple this kit is, without all the frills and extras of similar kits. Get started with this beautiful, inexpensive 10-gallon aquarium! 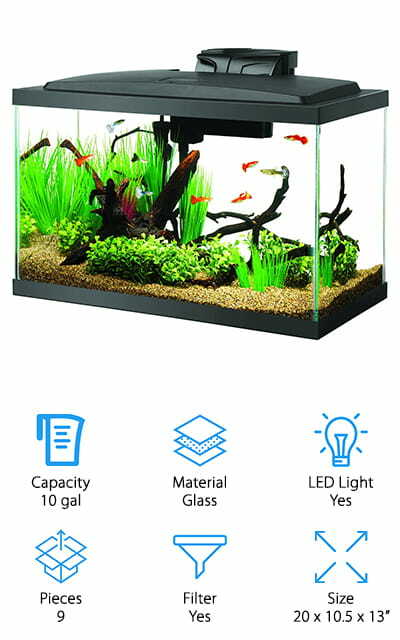 The Vepotek Fish tank is an exceptional fish tank for goldfish. It's made of tempered glass so it is less likely to crack or break. The pump and filter that it comes to perform very well while using the least amount of energy possible, so you can save money! There are 11 LEDs nestled in the hood with an on/off switch. These work extremely well and illuminate the whole 4-gallon tank. You can adjust the flow variables on the filter with a slider that requires no effort to change! The outlet swivels to help you obtain the perfect positioning in the aquarium so you get the most out of it. You can use the tank for both fresh water and salt water aquariums, and we love that versatility! You won't have to change out the tank if you want to switch from one to the other, only give it a thorough cleaning and you'll save some change!